The Friends of the Saint Paul Public Library is pleased to announce the winners of the 25th annual Minnesota Book Awards, presented by Marvin Windows and Doors. More than 800 people attended a gala award ceremony on Saturday, April 13, hosted by author and comedienne Lorna Landvik. In addition to winners in eight book categories, the Kay Sexton and Book Artist Awards were presented to previously announced honorees, Robert Hedin and Jana Pullman, respectively. Kids and parents alike will rejoice in this lively read-aloud picture book, as the main character runs into (and away from) a tiger, over and over again, while the plot gets sillier and sillier. LaRochelle is a previous Minnesota Book Award winner and lives in White Bear Lake. David Treuer – Rez Life: An Indian’s Journey Through Reservation Life – published by Atlantic Monthly Press/Grove/Atlantic, Inc.
From Minnesota Book Award-winning novelist David Treuer comes his first major work of nonfiction. Centered on Ojibwe reservation communities of northern Minnesota and Wisconsin, Rez Life is the first book written by an insider about what Indian reservations are, why they exist, and where they are going. A professor of literature and creative writing at USC, Treuer divides his time between Los Angeles and the Leech Lake Reservation in northern Minnesota. In David Housewright’s ninth novel in the Rushmore McKenzie crime series, thieves steal the 200-year-old Jade Lily from a Minneapolis art museum and then offer to sell it back for one-third of its insured value — $1.3 million. But there’s a catch. They demand that unlicensed private eye Rushmore McKenzie act as go-between. Housewright has won both the Edgar Award and the Minnesota Book Award for his crime fiction. In her story of working the land, Atina Diffley reminds us that we live in relationships—with the earth, plants and animals, families and communities. A memoir of making these essential relationships work in the face of challenges from weather to corporate politics, this is a firsthand history of getting in at the “ground level” of organic farming. Diffley and her husband, Martin, owned and operated one of the first certified organic produce farms in the Midwest from 1972 through 2007 and now run the consulting business, Organic Farming Works, LLC. Much of the focus on the Dakota people in Minnesota rests on the tragic events of the 1862 U.S.–Dakota War and the resulting exile that sent the majority of the Dakota to prisons and reservations beyond the state’s boundaries. But the true depth of the devastation of removal cannot be understood without a closer examination of the history of the Dakota people and their deep cultural connection to the land that is Minnesota. Drawing on oral history interviews, archival work, Mni Sota Makoce tells a detailed history of the Dakota people in their traditional homelands for hundreds of years prior to exile. Westerman is professor of English and Humanities at Minnesota State University in Mankato. White is author of We Are at Home: Pictures of the Ojibwe People. One Sunday in the spring of 1988, a woman living on a reservation in North Dakota is attacked. The details of the crime are slow to surface as Geraldine Coutts is traumatized and reluctant to relive or reveal what happened, either to the police or to her husband, Bazil, and thirteen-year-old son, Joe. While Bazil, who is a tribal judge, endeavors to wrest justice from a situation that defies his efforts, Joe becomes frustrated with the official investigation and sets out with his trusted friends, Cappy, Zack, and Angus, to get some answers of their own. In this New York Times Bestseller and National Book Award-winning novel, Louise Erdrich embraces tragedy, the comic, a spirit world very much present in the lives of her all-too-human characters, and a tale of injustice that is, unfortunately, an authentic reflection of what happens in our own world today. She lives in Minneapolis. A grim prognosis, brain cancer, leaves the speaker in Kirkpatrick’s Odessa fighting for her life. The tumor presses against her amygdalae, the “emotional core of the self,” and central to the process of memory. In poems emotionally charged but void of sentimentality, Kirkpatrick creates from loss a dreamlike reality. Odessa, “roof of the underworld,” a refuge at once real and imagined, resembles simultaneously the Midwestern prairie and a mythical god-inhabited city. In lines bearing shades of Classical heroism, Kirkpatrick delivers a personal narrative of stunning dimension. Awarded the first annual Lindquist & Vennum Prize for Poetry, which champions emerging Midwestern poets, the author lives in Saint Paul. Geoff Herbach – Nothing Special – published by Sourcebooks Fire/Sourcebooks, Inc. Nothing Special is the follow-up to Stupid Fast. It’s next year and Felton is as big and bad as everyone thought he’d be. Unfortunately, he’s still a little kid on the inside. He’s a jerk to his pal, Gus. His little brother, Andrew, struggles mightily without Felton’s help. Really, Felton’s got the curse of the monkey, real bad. He can’t see beyond his own tiny little problems. But if he doesn’t clean up his act, he’ll lose Gus. He’ll lose Aleah. And, honestly, he may already have lost Andrew who says he’s going to orchestra camp, but never shows up. Ride with Felton as he tries to “get his head out of his rear” and as he tracks his little brother to “the dangling sack of America” (Florida). Herbach lives in Mankato. At the Book Awards gala on April 13, Robert Hedin, founding director of the Anderson Center for Interdisciplinary Studies in Red Wing, Minnesota, received the previously announced Kay Sexton Award, for his lifelong contributions to Minnesota’s literary community. Under Hedin’s direction, the Anderson Center, now in its 18th year as the largest artist community in the Upper Midwest, hosts several literary events throughout the year where readers and writers gather, including the widely attended Celebration of Minnesota Children’s Authors and Illustrators held in September. In addition to directing the Anderson Center, Hedin has been the co-editor of The Great River Review, the oldest continuously published literary journal in Minnesota since 1997. The Award is sponsored by Common Good Books. Also presented was the sixth annual Book Artist Award, sponsored by Lerner Publishing Group and Minnesota Center for Book Arts (MCBA). The award, presented to Jana Pullman, recognizes the Minnesota Book Artist for excellence throughout a body of work, as well as significant contributions to Minnesota’s book arts community. Pullman’s work is currently being shown at St. Paul’s Central Library, 90 W. 4th St., through April and will be exhibited statewide at other library locations during the year. Books written by a Minnesotan and first published in 2012 were eligible for the 25th annual Minnesota Book Awards. 256 books were nominated for awards this year, and 32 books were selected as finalists. The winners were chosen by panels of judges from the list of finalists. Nominations for next year’s Awards will open in early fall, 2013. Apply to be a judge. The Book Awards gala will be broadcast at future dates on Saint Paul Neighborhood Network and TPT-Minnesota Channel. Please check local listings for channels and air dates. 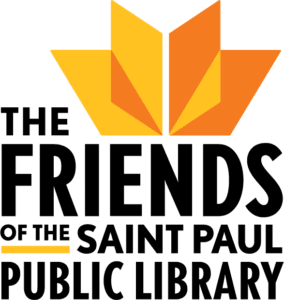 The 25th annual Minnesota Book Awards is a project of The Friends of the Saint Paul Public Library, with the Saint Paul Public Library and the City of Saint Paul. Statewide outreach partners include: the Council of Regional Public Library System Administrators (CRPLSA); the Loft Literary Center; Metropolitan Library Service Agency (MELSA); Minnesota Department of Education—State Library Services; Minnesota Educational Media Organization; and Minnesota Library Foundation. Media sponsors include: Minnesota Public Radio, Pioneer Press, Saint Paul Neighborhood Network (SPNN), PSAV Presentations Services and TPT-Minnesota Channel. Major funding for the Book Awards was provided by The Harlan Boss Foundation for the Arts; The Huss Foundation; The Katherine B. Andersen Fund of The Saint Paul Foundation; The McKnight Foundation; a Library Services and Technology Act grant administered through the Office of State Library Services; Books for Africa; Education Minnesota; Leonard, Street and Deinard; Marvin Windows and Doors; Meyer, Scherer and Rockcastle; Minnesota AFL-CIO; Sit Investment Associates; and Wellington Management, Inc.